HUNTING Debate: Is TrackingPoint the Future of Hunting? In the past I have written how I don't like long-range hunting. Not only do I feel few shooters have the skills to pull it off, I believe it removes a lot of why we hunt from the experience. But what if the lack of skill was out of the equation? What if a scope with an onboard computer made making 1,000-yard shots as common as 100 yards? A year ago I began hearing rumors about a scope/rifle combo that incorporates technology from fighter jets into a similar heads-up display that locked onto a target. Once locked on target, the scope's computer calculates range, angle, elevation and animal speed. All you have to do is hold the rifle's trigger back and wait. When all the math aligns, the gun goes off and perfect hits are made — at any distance, every time. Well, the rumor is now reality. The system is called TrackingPoint — and it's being marketed to hunters. 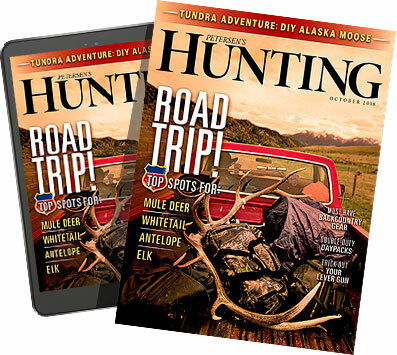 Eric R. Poole joined TrackingPoint on a hunt in Texas to test the technology. Eric is very good at long-range shooting, and he came back awestruck. He summed up the experience, saying, "The system makes it nearly impossible to miss. All you have to do is make the wind call and hold back the trigger. You can't jerk the trigger, and barrel movement doesn't matter as the gun goes off when the computer tells it to. It is truly amazing technology." I had to agree it is truly amazing technology and is why I had him write up the experience. Amazing, yes, and a wonderful tool for our military, but does it have a place in the hunting woods? If you want the animal to be eligible for Boone and Crockett recognition, the answer is no. By using a TrackingPoint the animal would be ineligible for entry, violating their standards of Fair Chase. "From our earliest days, the idea of Fair Chase was at the forefront of the budding conservation movement," says Keith Balfourd of Boone and Crockett. "Back then, wildlife was being overwhelmed by market hunters that were using any and all technology at their disposal with no regard for wildlife populations or the tradition of hunting. There had to be a distinction between legitimate sportsmen and market hunters." This really hasn't changed as technology continues to push the envelope. In 2003, the B&C Entry Committee put rules in place that disallow any scope that has a laser rangefinder built into it — as well as a host of other technology they deemed unfair. Balfourd continues, "Sure, it is a slippery slope. Just because something is legal doesn't always mean it is ethical. Every aspect of hunting is not covered by laws, nor should it be, but individual hunters need to ask themselves: is using this technology necessary, and does it feel right in their gut? Is it something they are proud of?" The biggest concern I have with this technology is the public perception. The majority of the public is in favor of hunting, but when this kind of technology emerges, does it make them think that hunting no longer requires any skill and is just about unfairly killing an animal? Will we all be tarnished by the actions of a few? And it is only a few. With a sticker price of nearly $30,000 per system, for most of us the ethics of this technology will remain a hypothetical question. If Internet videos are any indication of interest in a product, there is definitely interest in TrackingPoint. Recently, they ran a video of shooting African plains game at long range, and 662,000 people have viewed it. Their reactions? It's split: 1,120 positive, 792 negative.